The Bir-Hakeim bridge is a double bridge combining a metro railway and a road. It was built between 1902 and 1905 and it's a real masterpiece. No wonder then that a lot of photoshoots take place on it. Last Saturday it was not a fashion photo shoot that I witnessed, but a "simple" marriage one. Beautiful, isn't it? It's a beautiful location to begin with- that sky makes it all the more so- so I can see why it would appeal to wedding parties for photography. 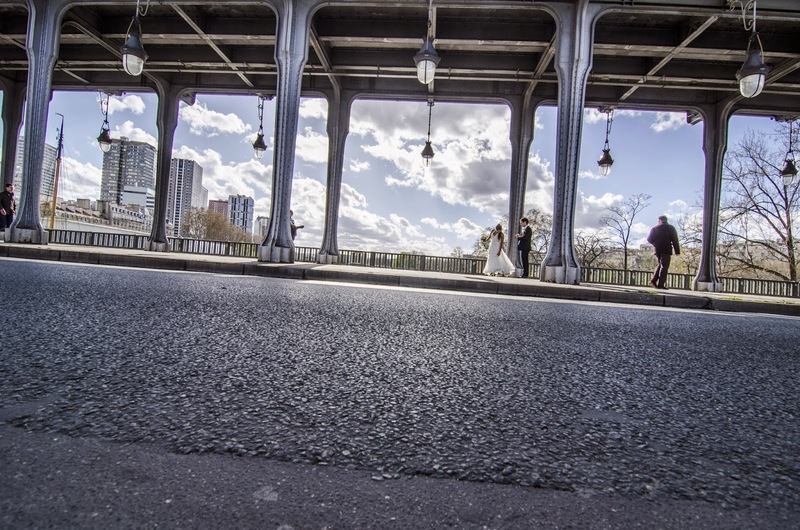 "Everybody" has to get their wedding pictures done in Paris, even if they don't get married there. Oh it is SO beautiful! I'm a professional wedding and portrait photographer, and it's my dream to shoot a wedding in Paris. Or do a fashion shoot there. One can dream!!!! I don't see how you managed to get both the dark asphalt and the bright sky exposed properly. What a pro you are.